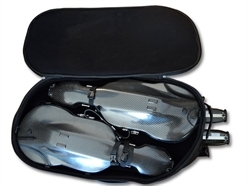 Thank you for your interest in the Trinity Violin Travel Set. We are making and shipping the Trinity Sets to violinists all over the world (over 600 sets so far). You are very welcome to order from String King. You can choose the set, separate cases and any accessory from the list using the Order Form. You will see the total price, including possible VAT tax (if you live in the European Union) and a courier shipment. Soon after we will send you a pro forma invoice, so you can make your bank transfer (for European orders). Customers outside Europe can preferably pay with a credit card (we’ll send you a payment link) or via PayPal (if absolutely necessary). Some time after receiving your payment we will send the package to you. The waiting time for a delivery is up to 1 week, but if you are in a hurry we can try to speed it up. If you have any questions, I will try to answer them and give you some advice. Please note, that this is still work in progress, so some details or materials may change (to the better). So, be aware that the ready products may differ from those shown of photos now. 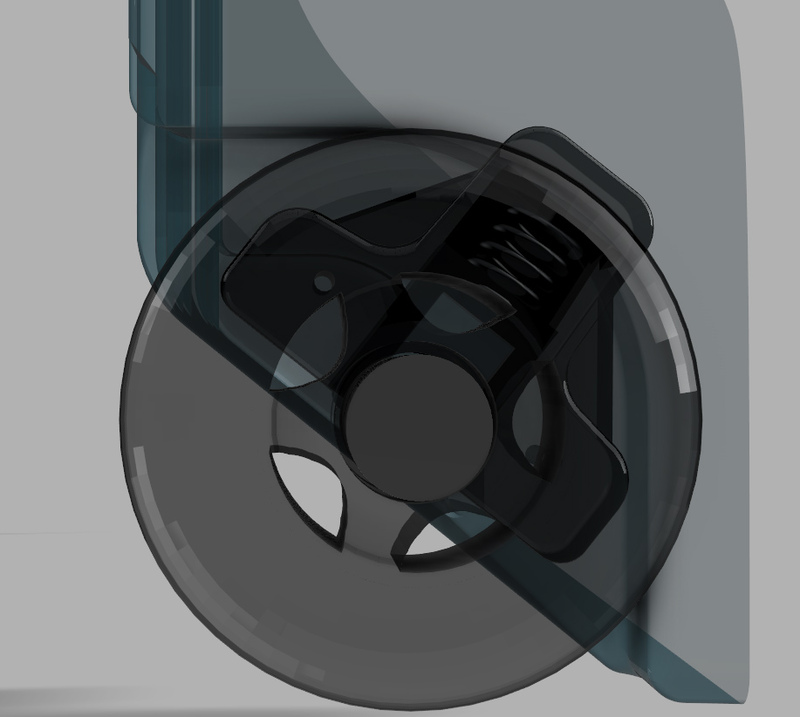 You have to add a detachable handle (fixed or revolving). 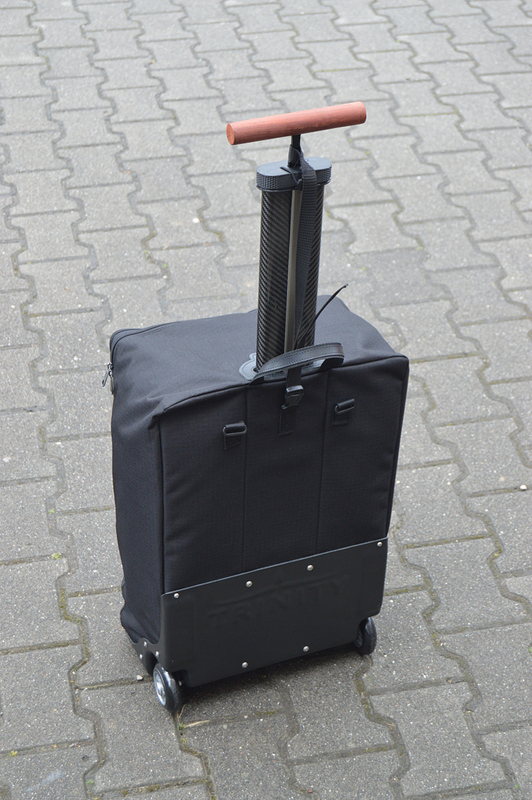 Add our own Spring Suspension System (SSS) to the Trinity SuitCase. 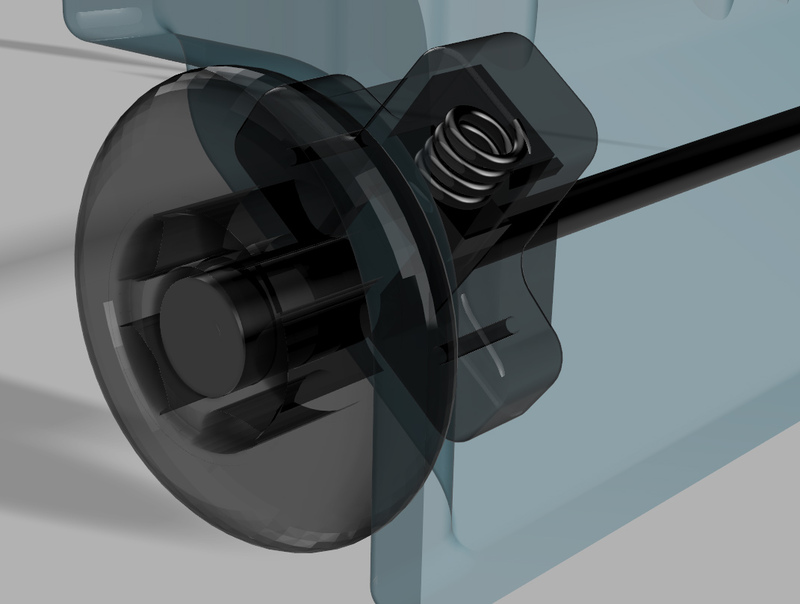 The wheels will damp vibrations a bit, like in a car. The ride will be even quieter and safer for a violin. black/dark brown/light brown leather details. 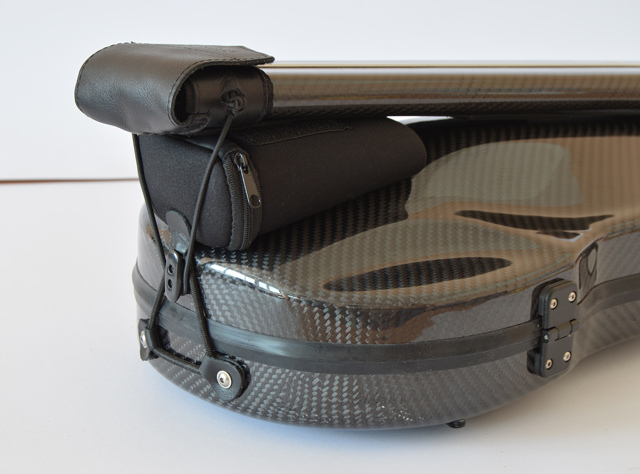 The composite shell consists of layers of the carbon fiber and glass fiber with the strengthening core material between. 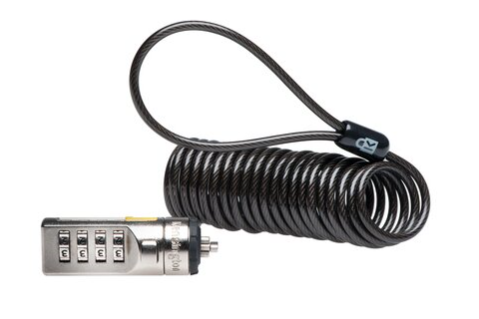 You can lock and secure this ViolinCase (simultaneously with the BowCase if you want) to any fixed object using the Kensington lock cable (order it below). See more in the Security section of the ViolinCase. Click here to go to Trinity ViolinCase subpage. composite shell with carbon fiber and glass fiber underneath. \Click here to go to Trinity ViolinCase subpage. and we’ll paint your case. Inside : grey fabric and black details. Trinity Basic ViolinCase is a cheaper version of our composite TrinityCase. It is made of ABS plastic and partially reinforced with carbon fibres. The Neoprene Soft Cover is included in the price. Read more here (new window will open). Outside: Carbon Fiber. Aluminum & composite reinforcement. 2 bow compartments with the security stopper. 2 bow-sheaths/covers. You can attach this BowCase to the ViolinCase with build in system. Add the Accessory Pockets (order separately). 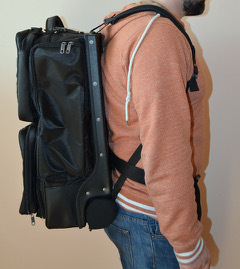 You can also carry the BowCase on its own, using supplied light shoulder strap. 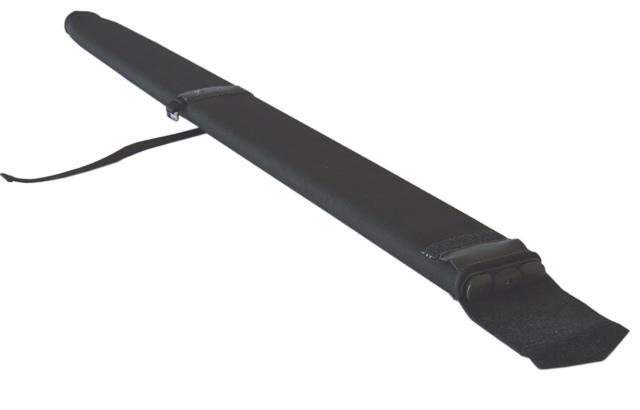 You can lock and secure this BowCase separately, or simultaneously with the ViolinCase, to any fixed object using the Kensington lock cable (order separately). Outside: Natural Jute Fiber. Aluminum & composite reinforcement. 2 bow compartments with the security stopper. 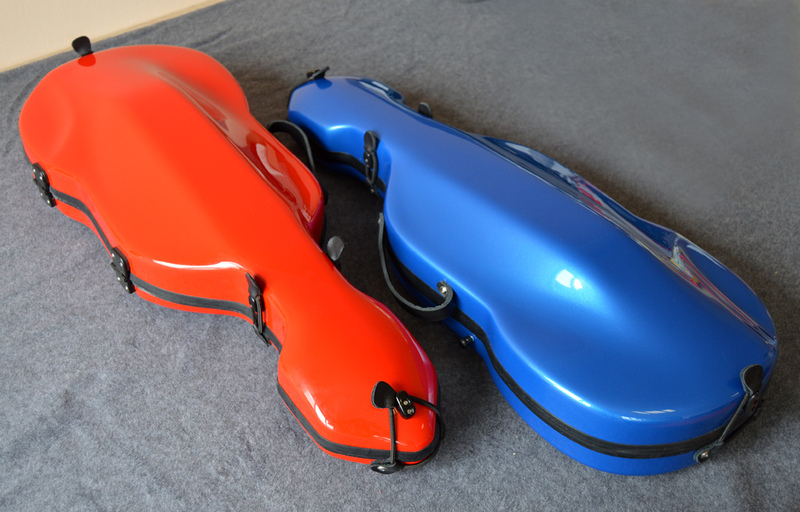 2 bow-sheaths/covers. Compatible with the Trinity SuitCase. 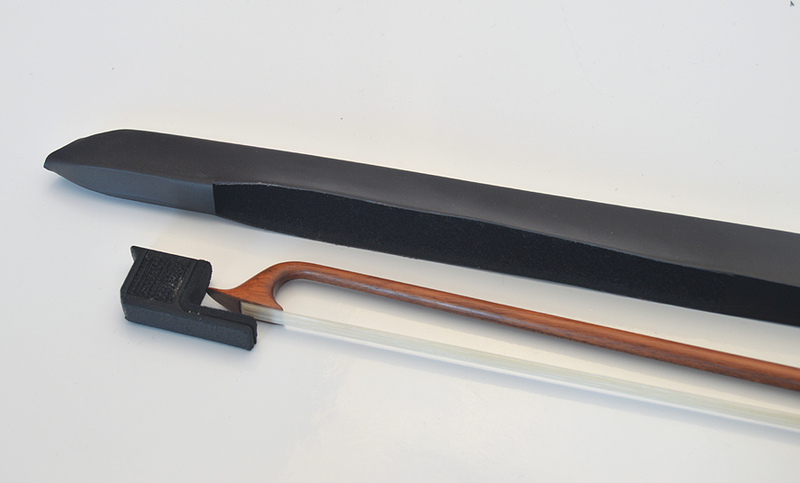 These bow-covers are prepared for installation of the special insert-element which adjusts the inside-length to different models of shorter historical bows. There’s no danger of a short bow moving around inside. It’s very easy to remove the insert and place the modern bow inside, if necessary. If you use historical models and bows - this is the upgrade for you. 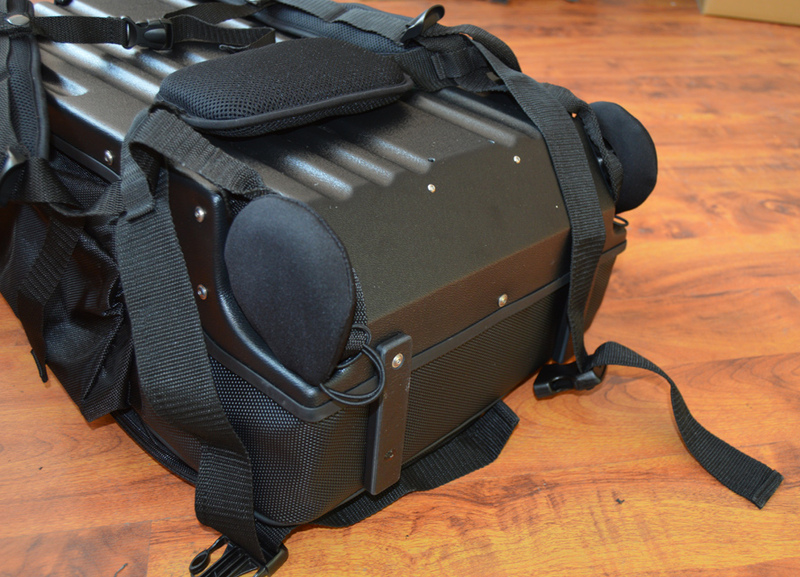 External Cover for the Trinity BowCase offers superior protection from impacts, scratches and extreme temperatures. It’s made of 2,5 mm soft, elastic but robust neoprene fabric, covered with strong polyester, used for making diving suits, or heat/cold isolating covers. So, if you want extra protection for your bows on the hot sunny day, or freezing winter night (or all year round) you can use this cover. 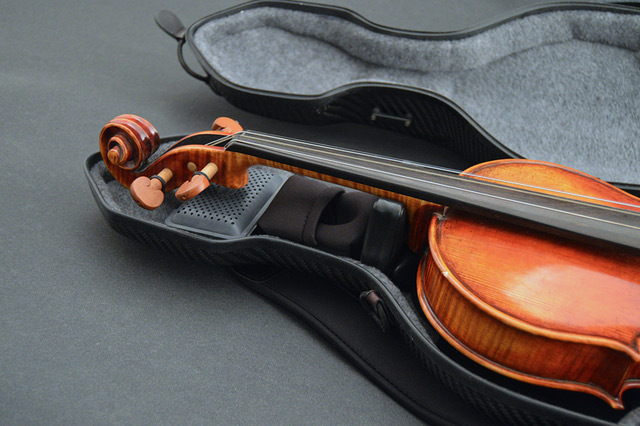 Using its straps and rubber ropes you can attach it to the ViolinCase. 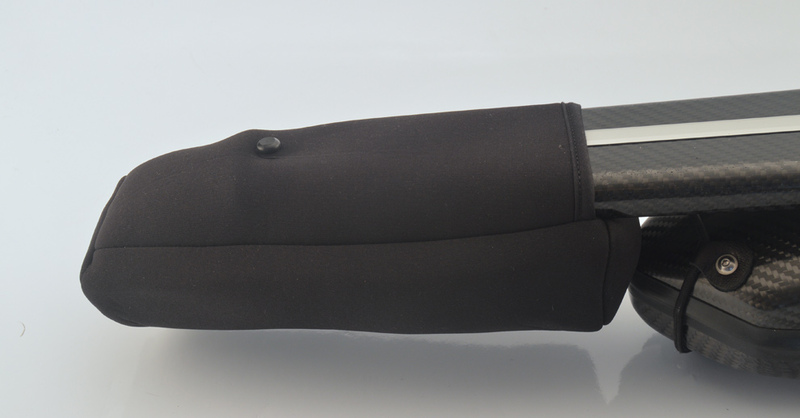 You can combine this cover with the optional Accessory Pockets (order them separately). 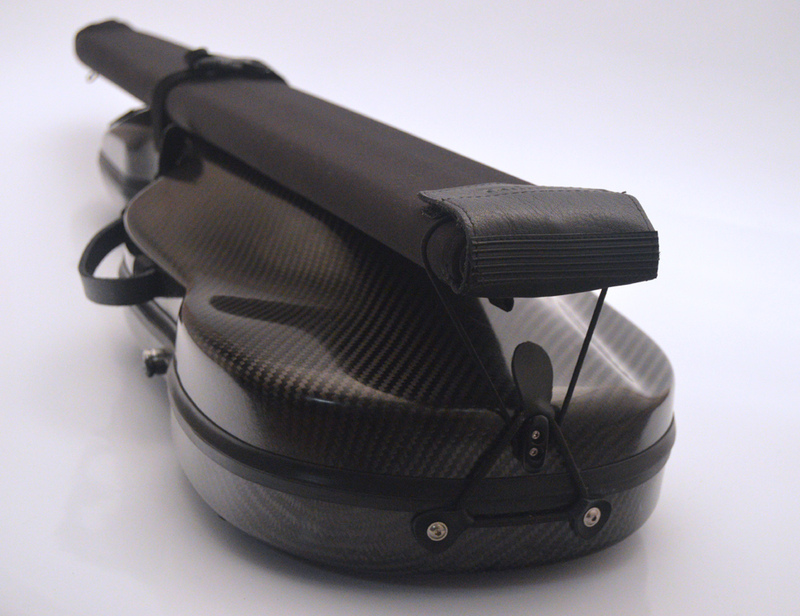 We add a detachable, thin shoulder strap, so you can carry the BowCase in its protective cover on its own. It offers a space for your shoulder rest, pencil, glasses , etc. 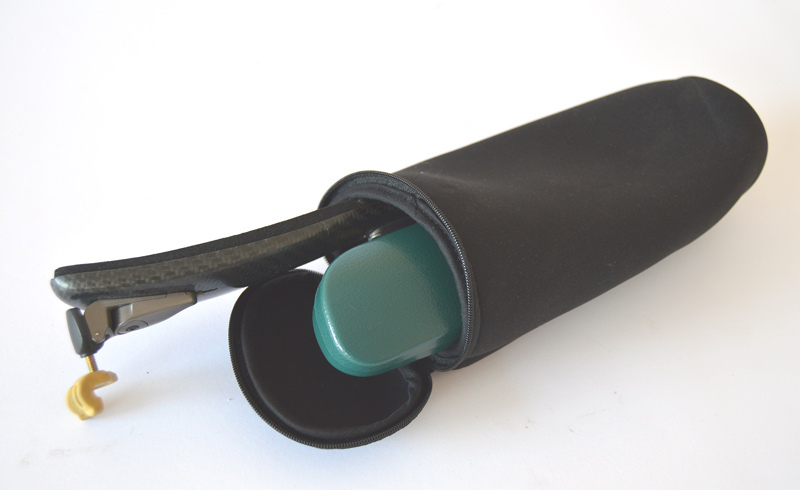 It’s made of 2,5 mm soft, elastic but robust neoprene fabric, covered with strong polyester, used for making diving suits, or heat isolating covers (so you can use it as a cold drink storage, if needed). This pocket can be put on the top of the External BowCase cover or directly on the BowCase itself. It gives you a space for the optional Kensington Click Lock (which can be used for securing all 3 parts of the Trinity Set), or other smaller items. It’s made of 2,5 mm soft, elastic but robust neoprene fabric, covered with strong polyester, used for making diving suits, or heat/cold isolating covers. 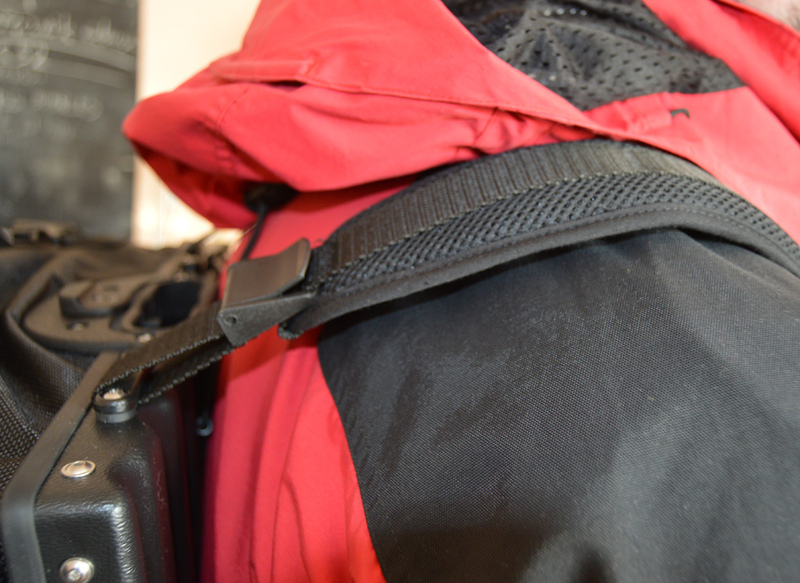 This pocket can be attached to the External BowCase Cover (order it separately), or to the BowCase Straps (included). Add the Kensington Click-Safe Portable Combination Lock. Trinity ViolinCase, BowCase and Trinity ViolinCase has a unique feature. You can lock it using Portable Combination Laptop Lock with a steel cable from Kensington (optional). All the cases ar prepared for it. 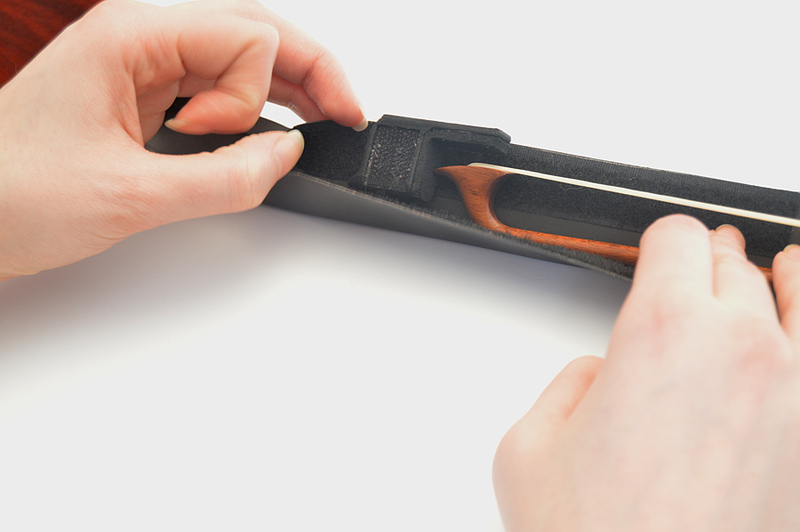 It prevents an unauthorized opening of the Violin Case and the BowCase and secures all 3 cases by fixing it to a firm object. Put in the T-Bar ™ of the Kensington lock into the slot in the metal plate of the ViolinCase’s lock. Of course you don't always need to use it; the case will still be securely closed. A 4-wheel number sequence can be set to an easily remembered code so you can put it to work quickly. It’s also resettable to any of 10,000 possible combinations. Of course you don't need to use it; the case will still be securely closed. See more in the Security section of the ViolinCase. Fits perfectly under the violin neck. Includes case and 2 humidification bags. The Stretto, made in Switzerland, is an effective system for maintaining a safe and consistent humidity level in your case's interior. 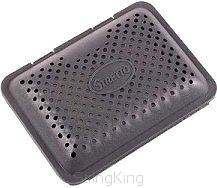 It features a perforated container that attaches with Velcro to the inside of the case, or store in case pocket. The Stretto bag efectively humidifies for up to two weeks. Due to its compact size, the Stretto fits in to any instrument case and is easy to use.Also it keeps gut strings in good condition. Size: 95mm x 65mm x 15mm. It can be attached to the back of the ViolinCase. Strong polyester fabric. 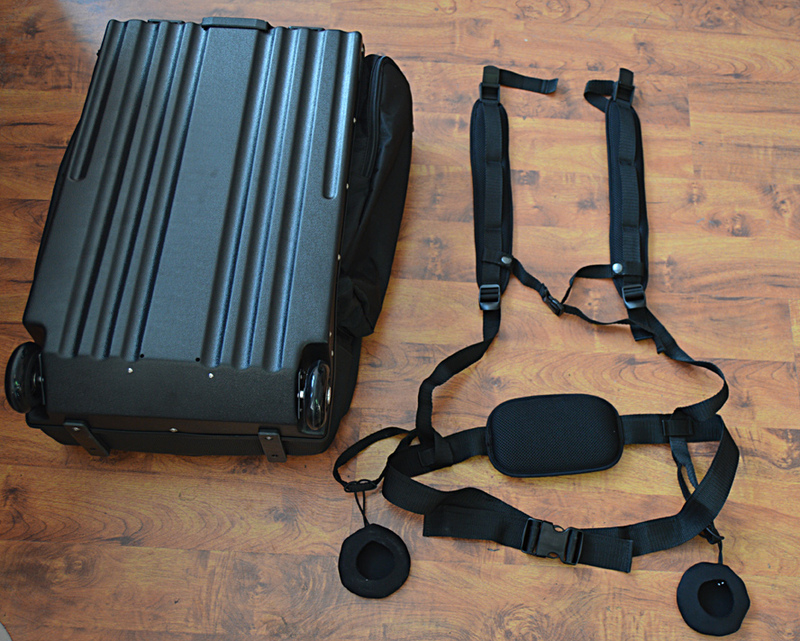 All the SuitCases are prepared for these straps, which you can store in one of the pockets. In seconds, you can attach the straps to the hard back and to the wheels (protecting your clothes from dirt at the same time). 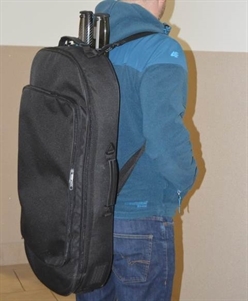 Without removing the ViolinCase and the BowCase you can cary the suitcase on your back; perfect when you travel with another big luggage, or there’s a lot of snow around. 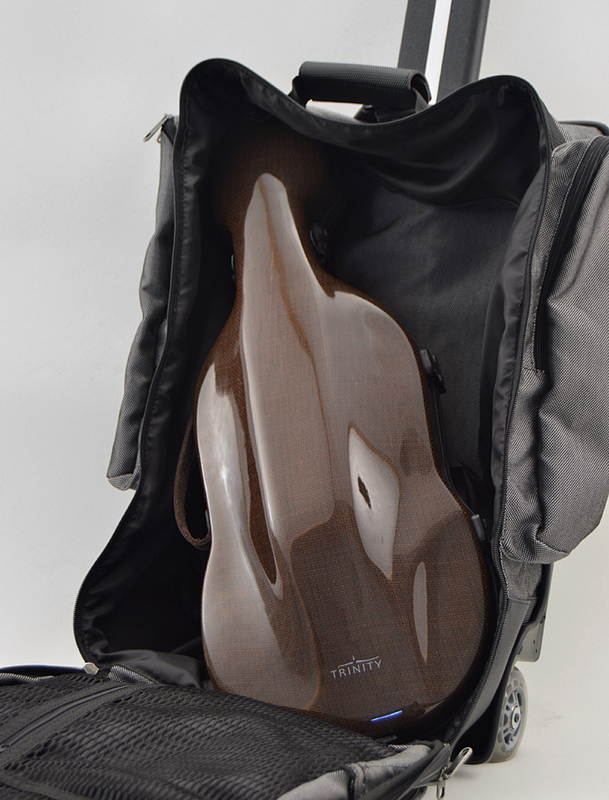 Inside this soft-padded cover there is space for the Trinity ViolinCase and up to 2 Trinity BowCases. In the storage compartment and around the case itself you can place your shoulder rest, strings, pens (may be even concert shoes?) etc., preferably in Trinity Accessory Pockets. There is a side handle and 3 detachable straps: 2 backpack straps and 1 shoulder strap. 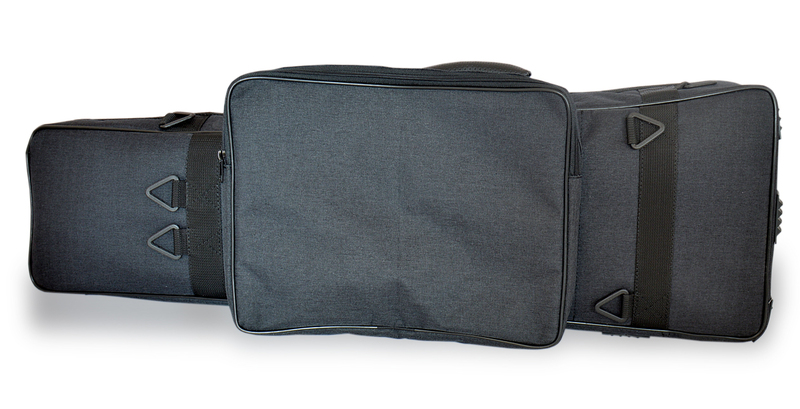 At the back of the Soft Case there is a flat pocket, measuring 36 cm x 22 cm, which you can use for smaller items. Into the same pocket you can tuck in a wing of the large Music Score Pocket (order separately). The Soft Case gives a possibility of carrying 1 violin and up to 4 bows, accessories and music scores in 1 compact “package”. 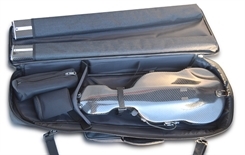 Many airlines allow an instrument case of such size onboard too. 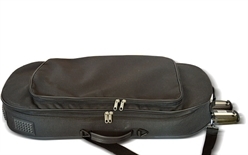 This pocket can be easily attached to the back of the Trinity Soft Case (containing the Trinity ViolinCase and 2 Trinity BowCases). It's made from the same strong nylon fabric as the Soft Case. 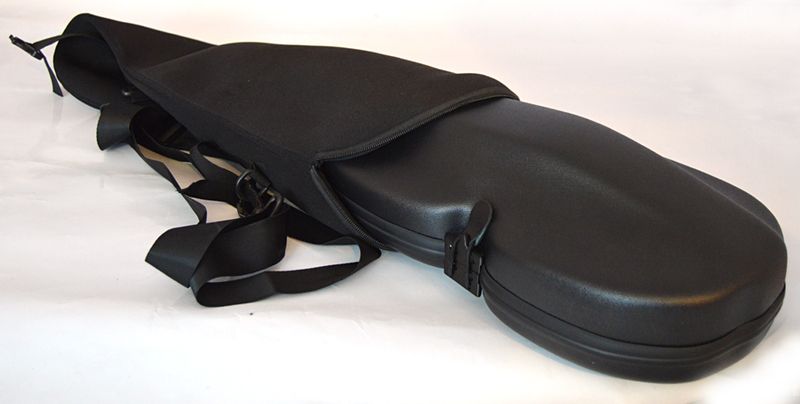 At the back of the Soft Case there is a flat pocket, measuring 36 cm x 22 cm, which you can use for smaller items. Into the same pocket you can tuck in a wing of the this large Music Score Pocket. 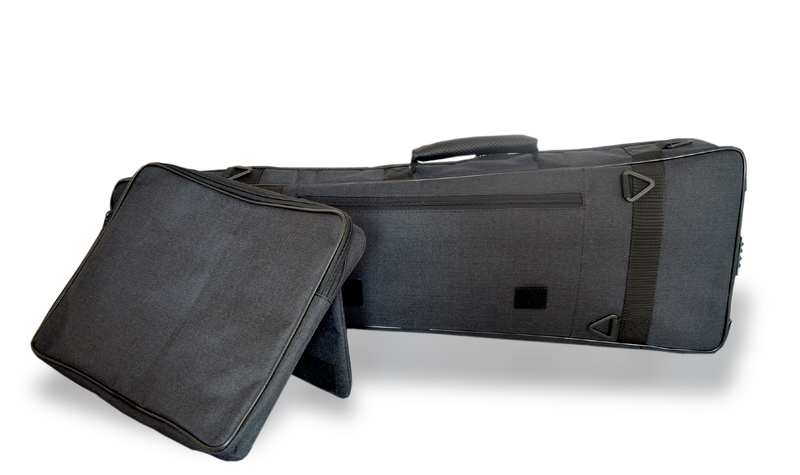 Extra velcro points attach steadily the Score Pocket to the back of the Soft Case. It’s possible to use the Score Pocket as an improvised music stand at the hotel etc., thanks to its back wing. 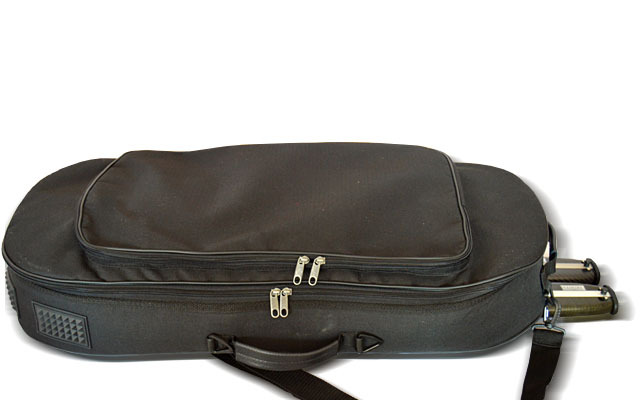 This Soft Case makes it possible to carry 2 Trinity ViolinCases inside (fixed with a neck strap) and 2 Trinity BowCases in the outside pockets. 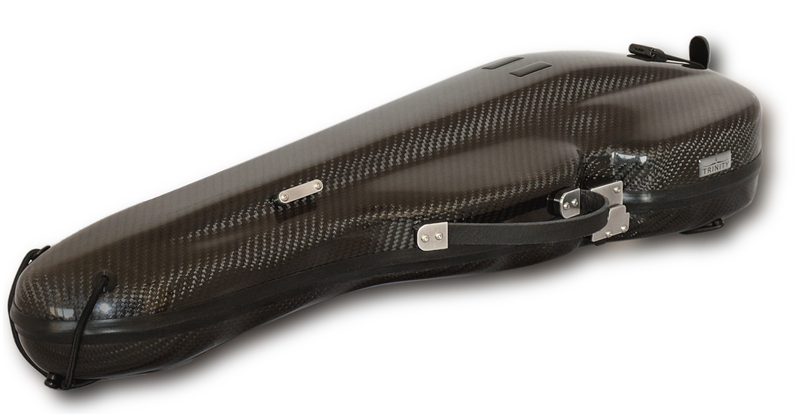 The case is padded, so it adds extra insulation and impact protection to already incredible strong ViolinCases. 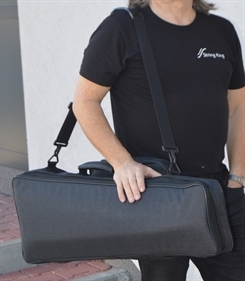 If you have already a composite ViolinCase you can add the cheaper Basic ViolinCase and place it inside, without its Neoprene Soft Cover. 1 or 2 BowCases stick out a little above, so we could keep the size of the Soft Case itself smaller. 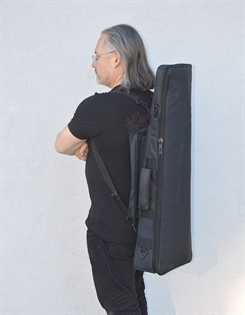 There is the large music score pocket on the top cover and 2 detachable shoulder straps. How is it possible to hide the bows in the cabin size luggage? It’s a little ”tricky”, but we solve it by placing 2 bows in our specially designed BowCase, which serves as the leading handle of the Trinity SuitCase, you can ”drive-in” onboard like an ordinary passenger with a wheeled suitcase. Onboard you remove the BowCase from the SuitCase and place it separately in a head locker. 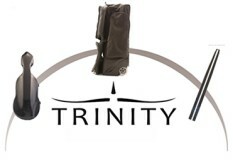 Can I use the Trinity SuitCase as a cabin luggage for all the airlines? 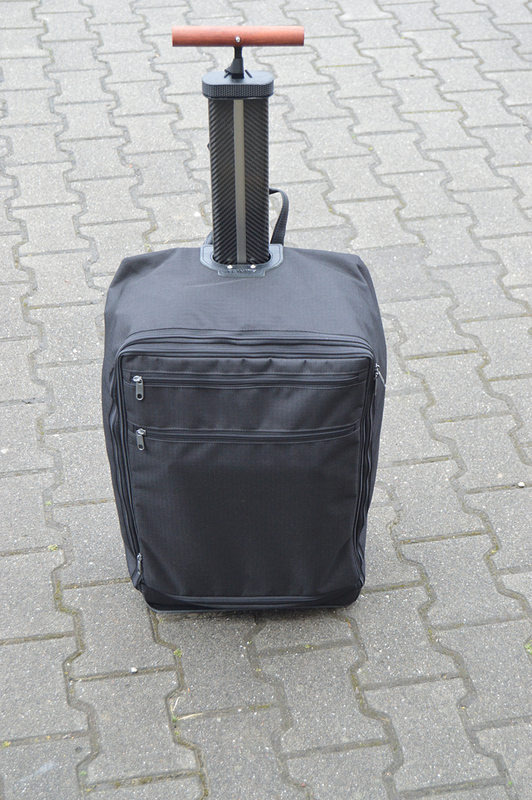 The SuitCase can be used with all the major airlines. There are some exceptions, like some local companies flying to smaller destinations, islands , etc. Sometimes you have to leave even a cabin-size suitcase when boarding a big plane (if there is too much hand luggage onboard). In such a situation you can just take the ViolinCase and the BowCase (possibly with the addition of our detachable lid of the SuitCase) bringing all the important objects with you into the plane. When you travel with many American Airlines, KLM, AirFrance (35 cm width allowed) you leave the side pockets empty and fill the top pockets up to 23 or 25 cm total thicknesses. 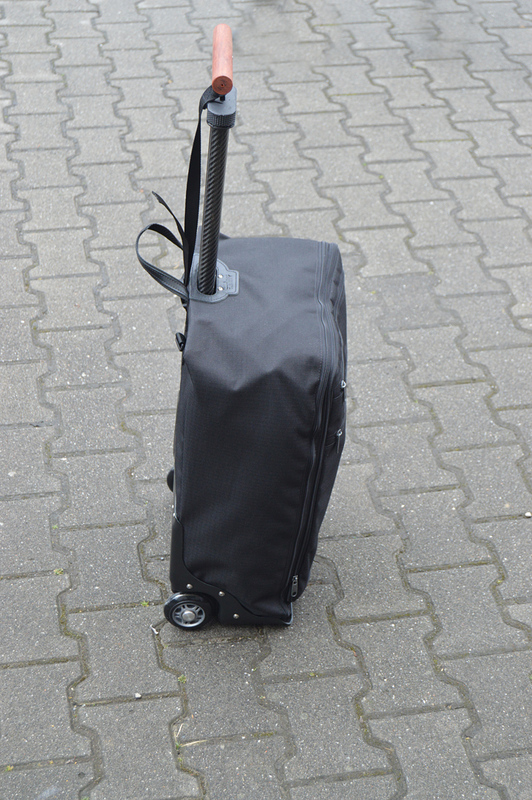 When you travel with Ryanair or Lufthansa (40 cm width) you can fill the side pockets slightly and with Easy Jet or British Airways (45 cm width) you can pack all the pockets to maximum. Many airlines allow the 2nd smaller cabin luggage. The SuitCase with the detachable lid is perfect in such a situation. The expandable top pocket of the SuitCase itself gives extra 5 cm space, so you can pack it to the maximum size (55x45x25 cm) and carry the detachable lid as a shoulder bag, This way you can manage even longer tours with Trinity only. Can I choose my material and color of the ViolinCase? Yes, you can choose between the Carbon fiber and Jute fiber outer finish. Each shell is made of a glass fiber and carbon fiber composite. 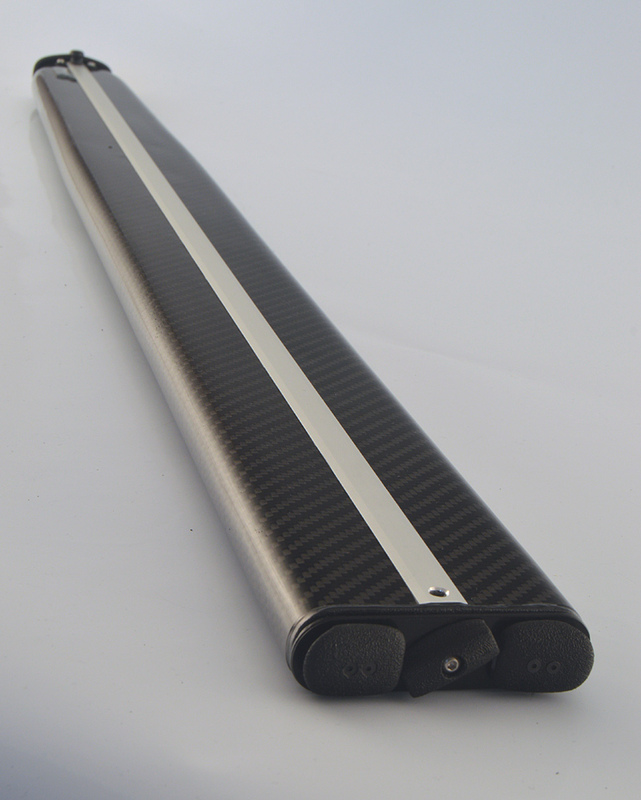 The standard outer finish is a natural carbon fiber surface. It can be painted in any color (optional). You can choose as well a natural jute fiber as the outer layer. It can be natural brown or dark red. Please, note: During the vacuum infusion process the carbon or jute fibers may get twisted in some spots. It can’t be avoided and it doesn’t influence the strength of the composite shell. Some small air bubbles may be visible in the resin coating as well. At the inside the standard solution is the grey felt with leather cushions (2 different styles) and details in several colors (black, dark brown, light brown, orange). We offer as well several other colors, as you can see on our photos. We use different kinds of felt and fleece as well (extra charge). All these option can be chosen in the Order form. 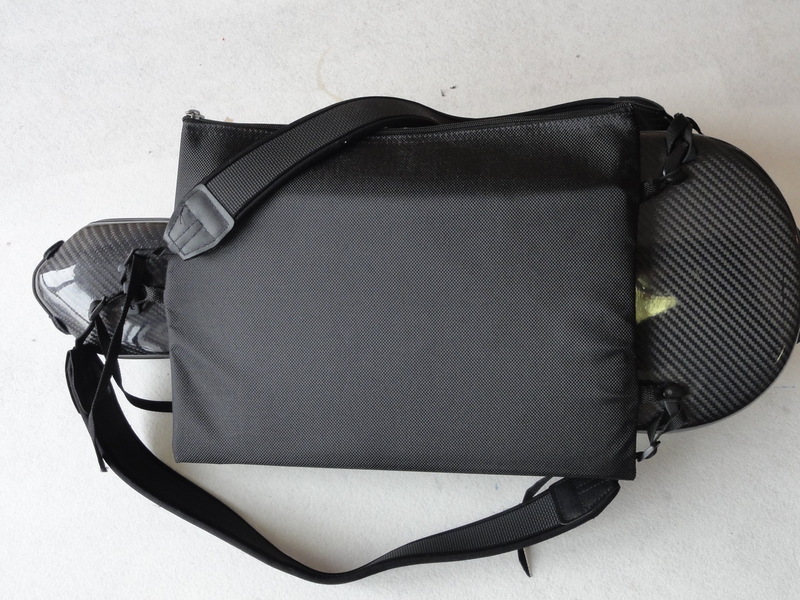 What is the difference between the Carbon Fiber and Jute Fiber shell? The Carbon Fiber shell has a reinforcing core material and glass fiber underneath. The natural jute fiber (used traditionally for making sacks) is a rather new and unusual composite surface. It looks very natural, but underneath there are layers of glass fiber and carbon fiber, so it’s a very robust construction as well. The jute shell is a slightly more elastic (less stiff) and about 10% heavier than carbon fiber (Jute absorbs more resin). How can I attach the BowCase to the ViolinCase? You can connect them both using the neck strap and the elastic which are attached to the ViolinCase. If you’d like to extra protect the BowCase from impact and temperature, you can add the optional External BowCase Cover made from a thick, elastic and insulating neoprene. 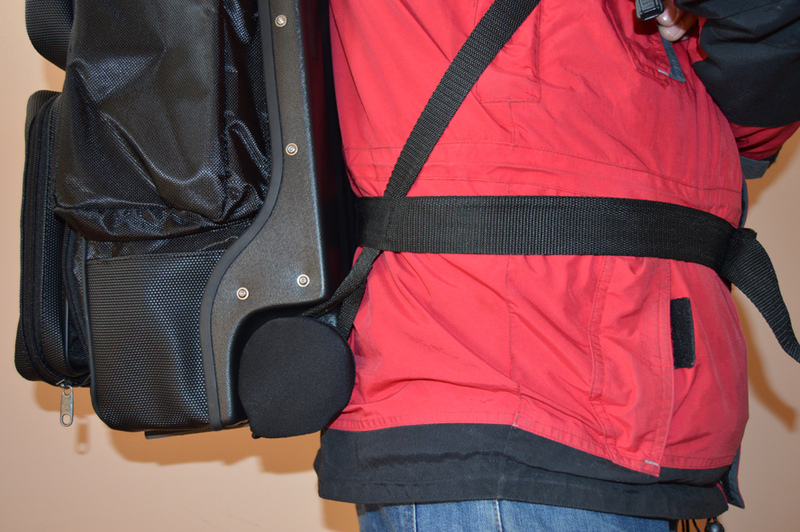 You can attach the supplementary Accessory Pockets (for your shoulder rest, Kensington lock , etc. to the BowCase or its cover. (There is a space for a rosin and strings inside the ViolinCase). 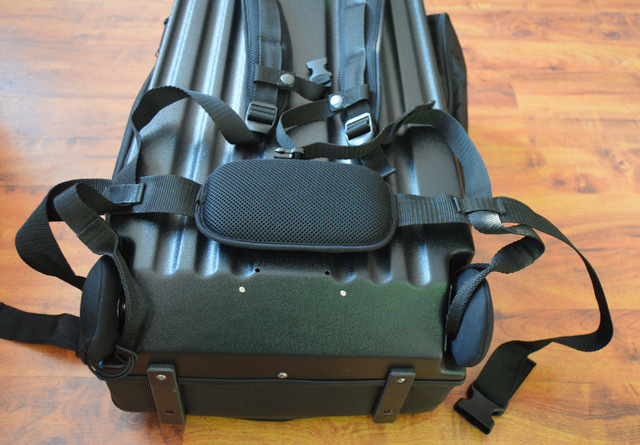 You can carry the BowCase on its own too, using the supplied thin strap. 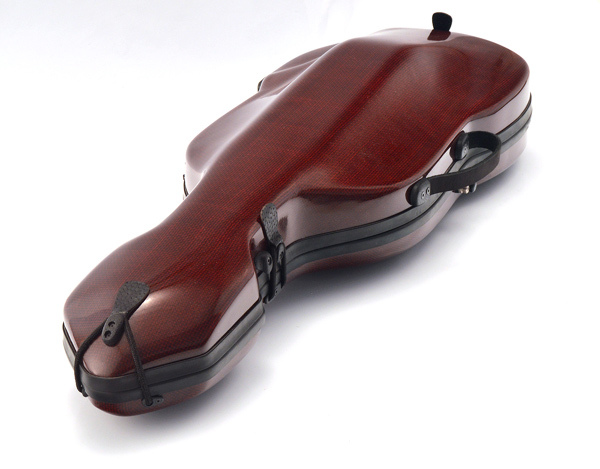 Is it possible to use the case with a chinrest on the violin? 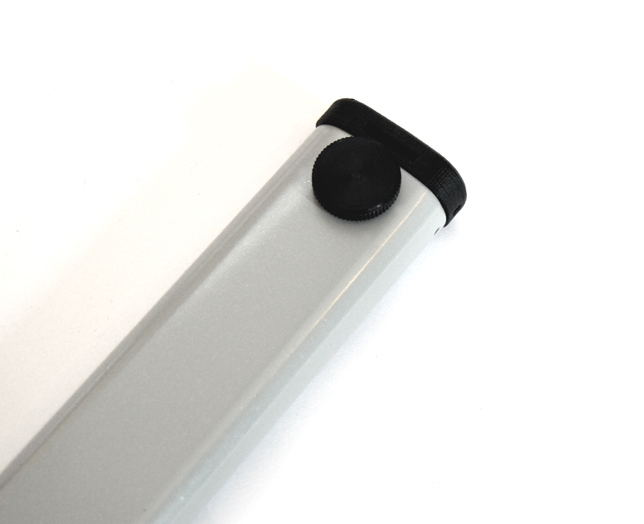 Yes, there is space inside for any model of chinrest (even very high ones - up to 70 mm) Do you have a guarantee? We give lifetime guarantee for the composite shells and for other parts and details we give 3 years guarantee. Just make photo of the damaged part and we will send it to you. Almost all the parts are easy to exchange with a help of simple tools. Return If the set doesn’t meet your expectations you can return products if they are not used. You have to pay for the shipment. We’ll send your money back (minus shipment cost). Can you ship to different countries? Yes, we ship Trinity with a courier. In Europe we use road transport as a standard and to the rest of the world it’s shipped by air. If you are in a hurry we can ship your order by air in Europe also (additional charge). If you live in a country outside the European Union - please, be aware of the specific import taxes and tariffs of the country you live in.